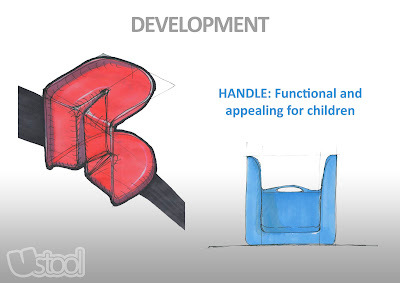 BRIEF: Design Play Furniture for children aged 3-5 years old. 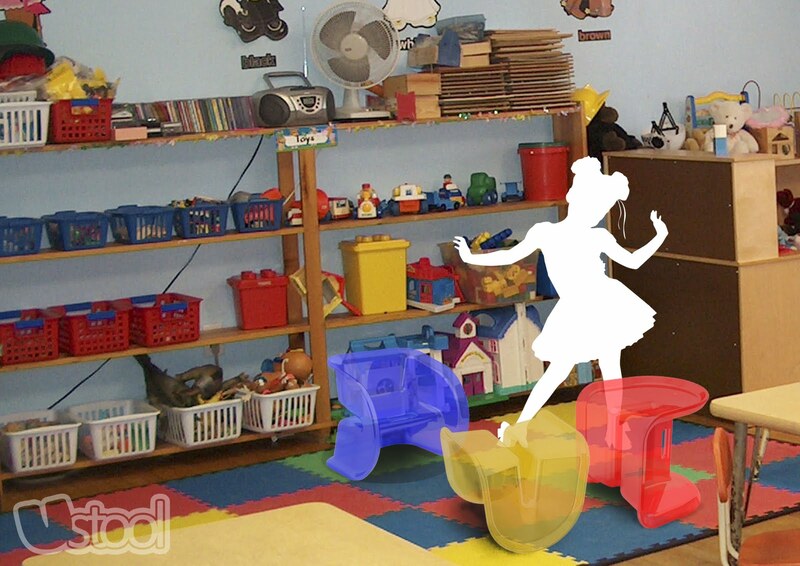 For this Studio Practice Project; PLAY+FURNITURE, we were given the task of designing Play Furniture that catered to 3-5 year old children in an educational environment. My design response is called the U Stool. I set myself a proposal at the beginning of the project to create parameters based on a visit from the department of Early Childhood Education, whom mentioned the need for personal furniture that can be used inside - and if need be, easily transitioned to an outdoor learning environment. 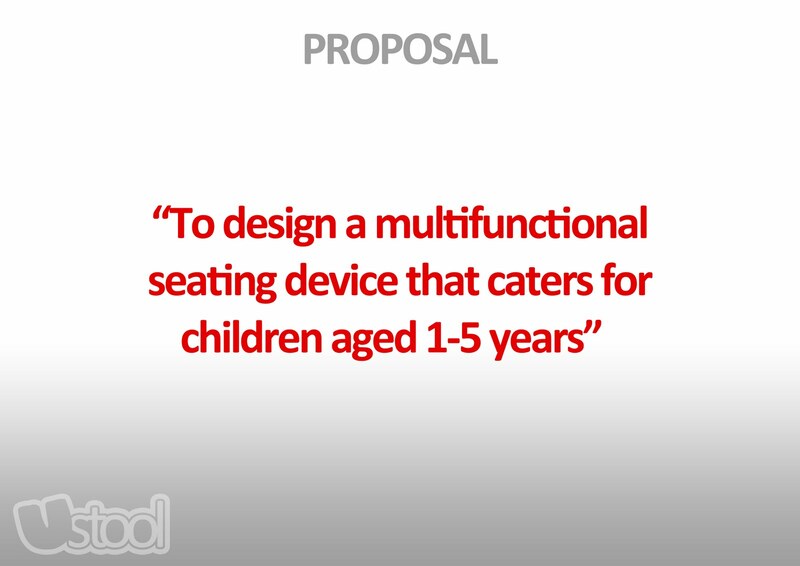 I wanted to design something that is considered common and not something that catered to a particular demographic or have a purpose that was too specific, whilst maintaining a focus on "personal" furniture. I started sketching a stool that presented different seating arrangements by simply rotating it in all dimensions, drawing inspiration from Verner Panton's 'The Panton Chair', and Philip Starks's 'The Louis Ghost Chair'. 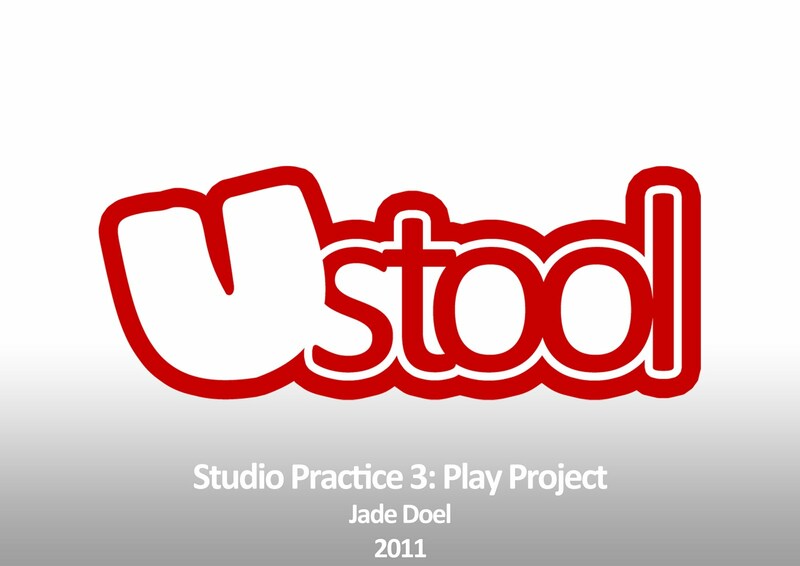 The design of the U Stool evolved through 3D model making, sketching and CAD. The addition of vertical fins on the red stool is a stability and strength design response and the incorporation of a handle in this development sketch was designed to make the U Stool appear more playful and inviting to kids, making them want to pick one up and carry it around everywhere they go. This enhances the "personal" aspect of the design. 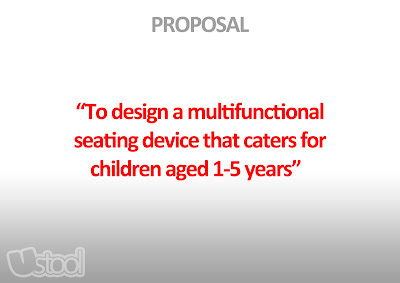 The brief stated that the Play Furniture was to be designed for 3-5 year old children. I saw this as an opportunity to extend the age bracket so to make the product more appealing as an investment for parents and schools. 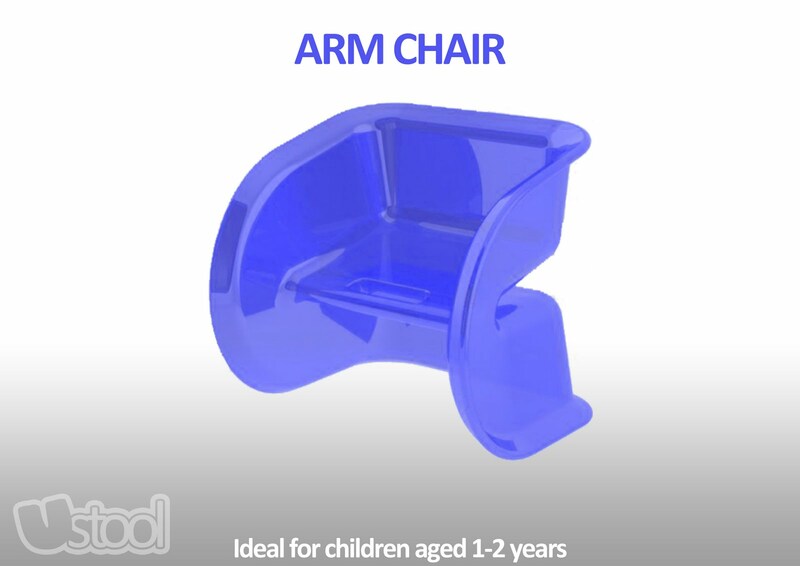 The challenge then was to design a seat that was not only ergonomic for 3-5 year olds, but 1-2 year olds as well.By turning the U Stool on its side it becomes an Arm Chair perfect for the proportions of the younger age bracket and has an average seating height of 200mm. The U stool gets it's name from it's 'U' shaped seat and is also a wordplay on it being designed for 'you' adding to its "personal" aspects. 'U' could also stand for "Unique, Universal, Utility and Uber". This is the U Stool's primary seating option, which has an average seating height of 320mm. The entire product its self is confined within the parameters of a 350mm cube. 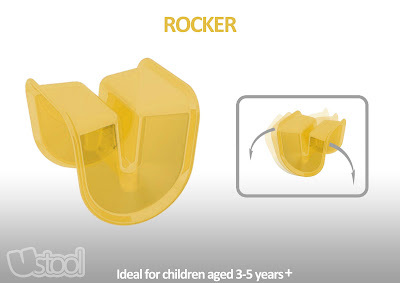 The Rocker is sat on so that the child can rock from side to side (not front to back). A child can play balance games simply by raising their feat off the ground and try to stay balanced. The seating position is designed to keep children's bodies occupied through movement. After doing research, it was found that children struggle to sit still when seated because their bodies naturally want to keep active. The Rocker benefits children by allowing their bodies to move whilst keeping their minds focused on what is being delivered in the classroom. A secondary benefit of the Rocker is that it enhances motor skills through balance, and supports core muscle exercises. 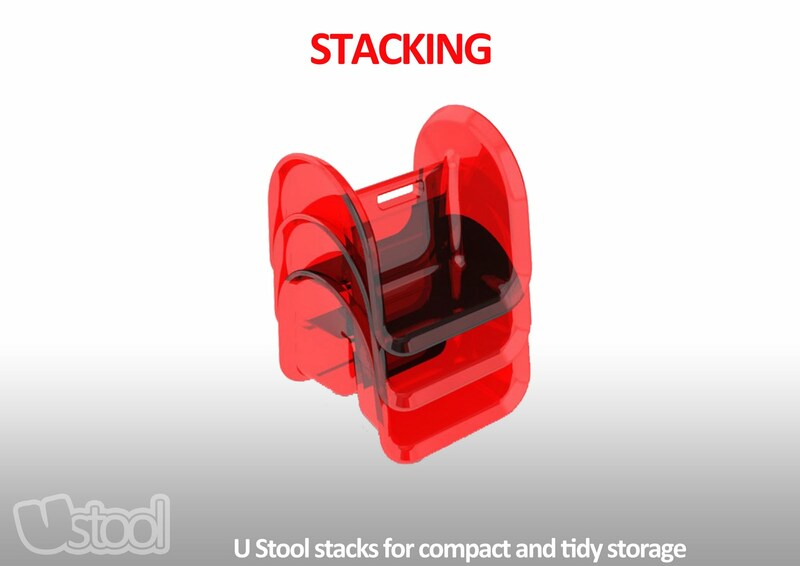 Each U Stool will be created in an Injection Moulding process from Polypropylene, which is the material of choice because of its cost:durability ratio and it's ability to be translucent. 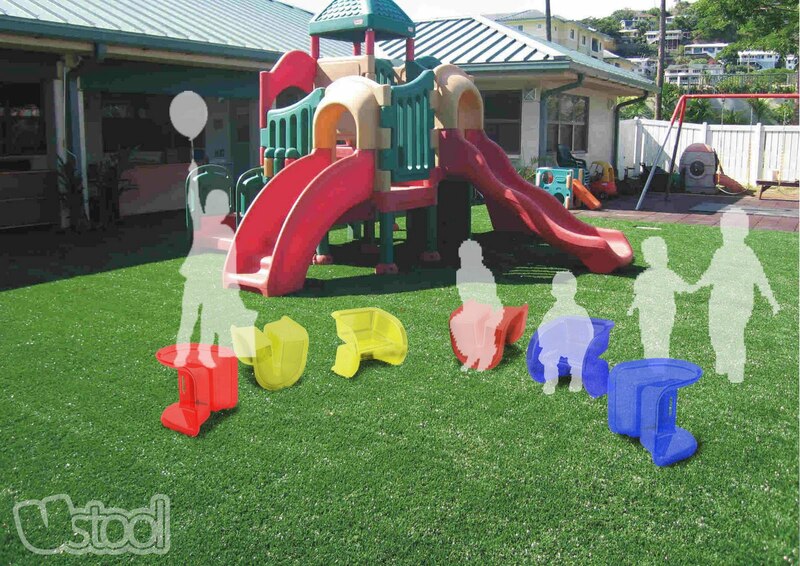 They will intensionally be made in three different colours; Blue, Red and Yellow as colour play is vital to the stimulation and development of a child's brain. With a set of primary colours and the clear qualities the material presents, I would hope to engage children in stacking two differing primary coloured U Stools together to create secondary colours (Orange, Green, Purple). 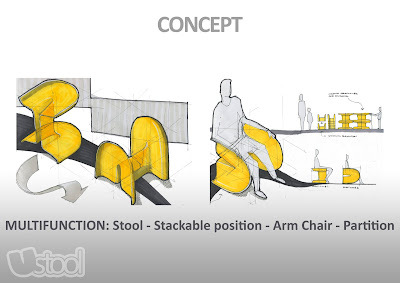 The U Stool has three very different seating styles in one product and is very complementary to an educational environment. 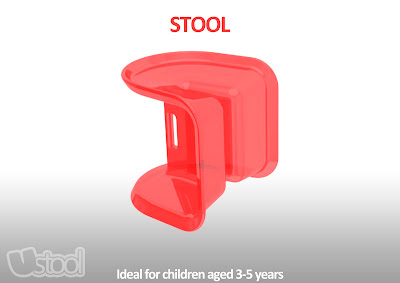 To make the U Stool truly personal and portable it had to be able to go everywhere with the child, which includes going outside.